UFC History Project: UFC 6: Can Ken Shamrock Tame The Beast? Matua is not playing defense, so he presents a big target for Abbott, who drills him with several shots. Tank knocks him out into a shaking, catatonic state, which Tank mocks. The whole fight lasted 21 seconds. Worsham is a former Marine who is ready to “party in the octagon.” He's fighting on nine days notice and is 5'10", 230 pounds. Varelans is 6'8, 300 pounds. Trap fighting is a "hybrid" form in which "you bait the trap and then you take your prey," Beck explains. When you're that size, do you really need to be that sneaky? Windmill brawling to start, and Worsham is more accurate, busting Varelans open. However, Varelans uses his size advantage, dropping an elbow to the back of Worsham’s head that turns out his lights at 1:04. Leon Spinks and David Hasselhoff are in the crowd, and another fan has a giant “Where’s Tyson?” sign. Good question! The whole country of Ecuador is pulling for Moncayo, and he says he doesn’t want to let his nation down. No pressure. Smith lost at UFC 1 to Shamrock and at UFC 2 to Gracie. He said he has the most experience, and "this is my big chance to win." Smith blasts Moncayo with a huge kick to the chest. Smith takes Moncayo down and transitions to a rear-naked choke for the win in 1:09. Both men lost to Severn in UFC 5: Taktarov in the semis and Beneteau in the finals. Beneteau is from Canada, while Taktarov is a champion in the Russian sambo style (hybrid of judo and wrestling), so both men have similar styles. Taktarov pounds Beneteau but falls victim to a takedown. This offensive pattern continues until Taktarov catches a bloody Beneteau in a guillotine choke for the submission in 57 seconds. 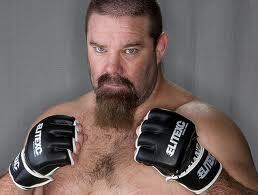 So the final four looks great, with Tank Abbott vs. Paul Varelans and Pat Smith vs. Oleg Taktarov. Now, I don’t want to say this too loudly, but let’s hope none of these four are too injured to keep going. Abbott is fresh, since he fought first and only for 21 seconds. Varelans has eight inches on him, though. The crowd chants “Tank!” Abbott takes the big man down and lays in some good shots. Abbott also grabs the fence for leverage while driving his knee into Varelans’ head. Abbott smirks at the crowd. Now I wish WCW would have let Vince Russo put the title on this guy. Hey, nothing else worked. McCarthy doesn’t think Varelans can keep going after a few more shots from Abbott, so he stops the fight at 1:51. Noooooooooo! Pat Smith has stomach cramps and he can’t continue! Anthony Macias will get the nod. Guy Mezger still doesn't get to fight! This is The Ultimate Injustice! According to Beck, Macias said if he doesn’t win, his career is over. The fighters are friends and have the same promoter. Macias walks right into a takedown and is choked out in 21 seconds. Uh-oh. The announcers think something fishy is afoot. Let's move on. Marco Ruas is from Brazil and he’s coming to UFC. He’s the “King of the Streets,” so he can wear an Armani T-shirt under his sport coat and still look tough. In a poll conducted on a new thing called “the Internet,” 55 percent of the fans pick Severn to win, with 39 percent going for Shamrock. Six percent call it a draw. Shamrock comes out with his Lion’s Den crew, including his adoptive father, Bob Shamrock. Severn’s entourage brings his NWA World title (pro wrestling) along with his UFC V tournament title belt. His manager, Phyllis Lee, says hello to Ohio. Hello, Phyllis! Shamrock has bulked up from 205 to 225 pounds, while Severn checks in at 260. After an early Greco-Roman wrestling standoff, Shamrock tries a guillotine choke but Severn slips out. Shamrock grabs the guillotine again and Severn taps out at 2:14! Shamrock said his scouting showed that Severn drops his head on takedown attempts, leaving himself open for the guillotine. Abbott has a 70-pound weight advantage and the fans on his side. He’s brawling at the outset, but Taktarov avoids major damage. Taktarov almost wins with a guillotine choke, but Abbott moves out. Now both guys are very tired, fighting for the third time at mile-high altitude. They slog through the next 10 minutes with Abbott on top for most of the time and neither man able to land anything big. Finally, McCarthy uses his newfound power to stand the men up, after a ton of warnings. Abbott backs Taktarov to the fence, but Oleg sinks in a guillotine choke. Tank escapes, but Oleg sinks in a rear naked choke and Tank taps out at 17:47! Both men need oxygen. Abbott is minted as a new star, and Oleg Taktarov is crowned the winner of UFC 6.